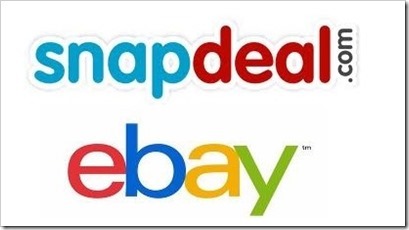 Ebay Leads in USD 50 mln investment in Snapdeal, forges multi-year commercial Partnership! Ebay Inc. has led investment in popular Indian e-commerce site Snapdeal. According to Dow Jones Business News service, Ebay is the lead investor in USD 50 Million round of funding. The funding round also includes participation from Intel Capital, Nexus Venture Partners and other firms. This investment values Snapdeal at USD 250 million. This is a more of a strategic investment from Ebay as it also entitles commercial partnership with them. With this investment, eBay will not only gain access to over 20 million registered users, but also their Logistic and distribution network. On the other hand, Snapdeal stands to gain a lot from this investment as well. Along with the much needed funds infusion, they stand to gain from eBay’s vast experience as well as huge global customer base. The commercial partnership between Snapdeal and Ebay entitles both entities to offer their catalogue of products on each other sites. As of now, not too many details are given. However, Snapdeal’s CEO Kunal Bahl made a statement saying “We’ll be offering a thoughtful assortment on each other’s sites”. The statement clearly suggests that the investment deal is more focused on commercial partnership and leveraging the huge customer base built by both the ecommerce giants. In my personal opinion, this is a win-win for both the entities which allow eBay to expand their international customer base and sales, which have been subdued in recent times. At the same time, it offers Snapdeal a good legroom to grow in the increasingly competitive Indian E-Commerce market. We are trying to get further details on this deal and will update this post as soon as we hear about it! Japan keen to offer Indians the Bullet Train Technology! eBay is quite popular eCommerce firm all over the world, and now it has targeted the Indian market for sure..In past few months it has invested a lot in promotional activities and advertising purposes.. Its main competitor Amazon too has come up with its own marketplace for India, that’s why eBay though that it is the high time and it should take an action…As a result it invested on Snapdeal, which is one of the leading eCommerce firms in India….